Sometime in the early 2000's, my parents gave me some boxes of my old stuff, including all the My Little Ponies that I used to play with. I wondered if they were worth anything, and got on ebay to find out, thinking I might sell them if they were. However, looking at them on ebay sure brought back the memories of taking my ponies and playing at my best friend's house with them. She had the Dream Castle, so I always went to her house. Instead of selling off my ponies, I ended up buying all the ones my best friend had that I didn't have, as well as ones I had wanted but never had. And I found the MLPTP and learned about ponies I had never heard of, and bought even more! I even did a bit of customizing, primarily for myself and my children. 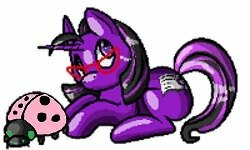 I was pretty active on here for quite a while, but in the meantime my family was growing, I was homeschooling, and I just didn't have much time for ponies anymore, so eventually I stopped coming here. I now have 5 children and a small farm, so I still don't really have time to be an active member, but I do have some ponies that I meant to sell years ago so thought I'd see if the MLPTP was still around. Hopefully I'll be able to get pictures and descriptions of them up sometime in the not too distant future. And don't worry, all my kids love My Little Pony, and we still have plenty of them around! Welcome back! Pony abyss caught you as well as it does so many of us. We do not know each other but welcome back. Welcome back! I also gone MIA for some years, but I'm also back! Welcome back! It's sounds like you've been super busy in your absence! Can't wait to hear all about your adventures!